Students pitched business plans to judges at the third annual GOJA-iChange FIU Social Innovation Challenge on March 27, 2019.
Business professionals have called Miami an ocean of opportunity for entrepreneurs, and Florida International University students have shown they are ready to dive into uncharted waters. According to Gonzalez - whose company donated $10,000 for top prizes for the social innovators - students have what it takes. 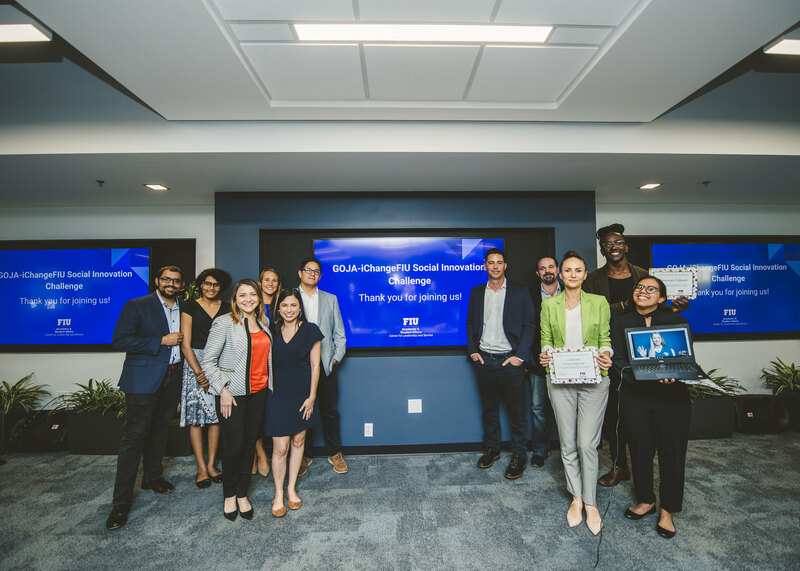 Fivegroups of student entrepreneurs culminated a full academic year of ideation, learning and experimentation at the GOJA-iChange FIU Social Innovation Challenge final pitch event. The event came as part of Changemaker Week: a weeklong, university-wide initiative to engage students in social innovation and entrepreneurship offered by the Office of the Provost, the Center for Leadership and Service, the Honors College, the Office of Global Learning and StartUP FIU. Amanda McDole, assistant director of Changemaker initiatives from the Center of Leadership and Service, said that the goal of the programming was to show students that it doesn't necessarily take a business degree or $1 million to create something that makes social change. FIU News caught up with some of the students who pitched their projects at the event on March 27. We asked them what they have been working on, and what advice they had for next year's cohort of innovators. For the next week, we'll feature their stories as part of our FIU Social Innovator series. First up is Yashaswi (Yashi) Tapadia, a sophomore studying economics, who is working with a team to bring greenhouse technology to schools in India and inspire children of farming families. 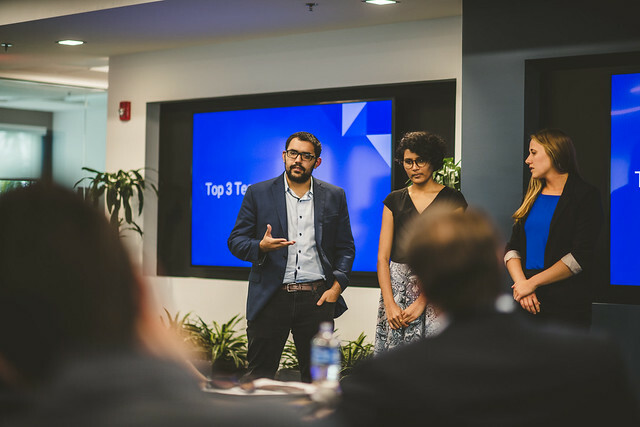 Arquimides Perez-Leyva (left), Yashaswi Tapadia (middle) and Katie Friescen (right) pitch 'Vikaasha' to judges at the GOJA-iChange FIU Social Innovation Challenge on March 2017, 2019.